2. The graph shows the changes in free energy before, during, and after a biochemical reaction. Which describes the effect of a catalytic enzyme on this reaction? A. Energy decreases at point 1. B. Energy increases at point 1. 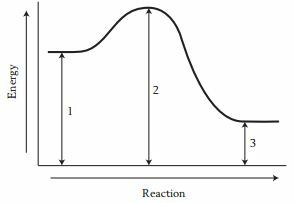 C. Energy decreases at point 2. D. Energy increases at point 2. E. Energy decreases at point 3. 4. People with an A-positive blood type may safely donate blood to those with which blood type? 7. A genetic mutation that adds a nucleotide to a protein-coding sequence of DNA creates an early stop codon. How will this influence the resulting protein? A. The primary structure of the protein will be unaffected. B. The secondary structure of the protein will be unchanged. C. The protein will not be translated at all. D. The protein will be complete but function abnormally. E. The protein will be synthesized normally up to the mutation. 8. What are the three structural components of a nucleotide? 10. How will the function of a neuron be affected if the potassium channels of the membrane remain open? A. It will continue to function normally. B. It will function inconsistently. C. It will no longer function due to sodium leakage. D. It will continue to function but not transmit any impulses. E. It will no longer function due to an overly positive charge. 11. 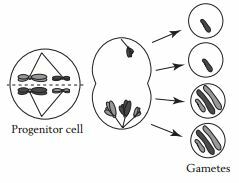 Which can affect the primary structure of a protein? 12. Which type of bond is broken by the helicase enzyme? 13. A sample of DNA is sequenced and is found to consist of 32% guanine. Which conclusion can be drawn about the composition of the DNA sample? A. It consists of 18% cytosine and 18% thymine. B. It consists of 18% adenine and 18% cytosine. C. It consists of 32% cytosine and 18% thymine. D. It consists of 32% adenine and 18% cytosine. E. It consists of 32% thymine and 18% adenine. 15. Scientists constructed a phylogenetic tree of modern lizard genera based on DNA sequences, shown below. Which genus can be identified as the closest relative of the genus Pletholax? 16. Scientists constructed a phylogenetic tree of modern lizard genera based on DNA sequences, shown below. Lizards from which two genera most likely have the greatest number of noncoding DNA differences between them? 17. Scientists constructed a phylogenetic tree of modern lizard genera based on DNA sequences, shown below. Within this group of lizards, several genera have evolved characteristics similar to those found in snakes. 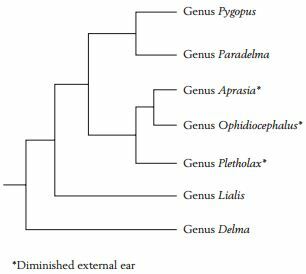 One mutation contributed to a diminished external ear in the genera indicated by an asterisk. What is the most recent point at which this mutation most likely occurred? 18. A female chimpanzee recently gave birth to an infant while in captivity. Because the paternity of the infant is unclear, scientists tested the DNA from two male chimpanzees, along with the female and infant. The resulting electrophoresis gel is shown. Which labeled DNA fragment is largest? 19. A female chimpanzee recently gave birth to an infant while in captivity. Because the paternity of the infant is unclear, scientists tested the DNA from two male chimpanzees, along with the female and infant. The resulting electrophoresis gel is shown. Which fragments must the infant have received from its father? 20. A female chimpanzee recently gave birth to an infant while in captivity. Because the paternity of the infant is unclear, scientists tested the DNA from two male chimpanzees, along with the female and infant. The resulting electrophoresis gel is shown. Based on the gel electrophoresis result, what can be concluded? I. Male 1 could possibly be the parent. II. Male 1 can be ruled out as the parent. III. Male 2 could possibly be the parent. IV. 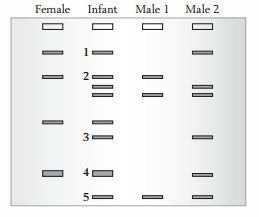 Male 2 can be ruled out as the parent.